Afternoon, 4:30pm - I went to stadium swimming pool and I managed to do 600m of swims. Since it was still early, I've decided to run. 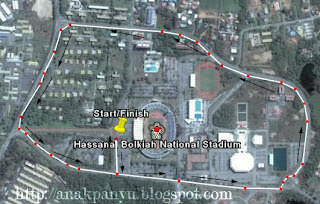 It's been 3 weeks since I last run - Bukit Shahbandar Challenge. Since I didn't wear my Garmin, so I measured the distance using Google Earth. I decided to start my run in front of the national stadium, so I moved my car from the swimming pool parking lot to the stadium parking lot. I've managed to run 3.90km in a time of 21:48:07 minutes. Slow rasanya macam panyu ketulahan. Berat rasanya lama inda berlari ani. I was breathing heavily, I was feeling rather sluggish. Kalau macam ani rasanya, I ought to start back running as soon as possible. No, I should have started yesterday.